Fast and Furious star Paul Walker and former racing driver friend Roger Rodas were killed instantly after the Porsche Carrera GT they were driving smashed into trees and bursts into flames. Although investigation on the exact cause of the accident is still ongoing,it is becoming increasingly apparent that the high-speed Carrera GT super-car could be too dangerous to drive. Authorities in Los Angeles where the fatal crash that killed Paul Walker and his close friend happened have revealed that speed was a factor in the accident. Investigation on how fast the Porsche Carrera GT was going is still underway, but reports emerging indicate the car (which is notoriously difficult to handle) might be too dangerous to drive even for professional drivers like the pair. The super-Carrera GT has a very high-revving V10 engine and more than 600 horsepower, which is three times the horsepower of the average car. Todd Trimble, an exotic car mechanic in Las Vegas, described the Carrera GT as a "very hard car to drive." He said, "It's (a) pure racer's car. You really need to know what you're doing when you drive them. And a lot of people are learning the hard way." Top Gear's Jeremy Clarkson who road-tested the German car in August 2008, describes the car as "brutal and savage." He said: "You need to be awake to drive this fast. It really isn't an easy car to control. The clutch is brutal, the power is savage and the handling....you really are on a knife edge. But if you put in the effort boy, oh boy do you get the rewards. "It is a phenomenal - mind blowingly good. Make a mistake - it bites your head off," Clarkson concluded. The Porsche Carrera GT with a top speed of 208 mph is exhilarating, but the reason the car is so unforgiving with mistakes is because it has no electronic stability control. According to Eddie Alterman, editor-in-chief of Car and Driver magazine, this was not a car for novices. 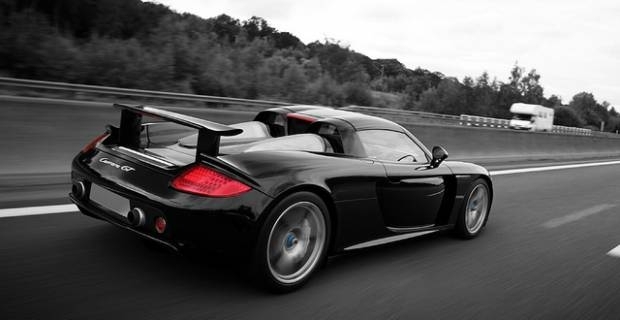 The Carrera GT program actually began as a racing program. Clarkson adds that drivers are on a "knife edge" handling the 612 bhp road beast that goesfrom 0-60mph in a staggering 3.9 seconds. You are warned to drive the Carrera GT with great caution. Walker who was pictured with the car just hours before the shocking crash was by far the best driver – a natural car guy, says Eddie.